MCF-7, T47D or MDA-MB-231 cells were treated with a series of concentrations of RA for 48 h in the absence or presence of 20 μmol/L CQ. After treatment, cell viability was measured using a CCK8 reagent. The results are displayed as the mean±SD of triplicate measurements from one of three identical experiments; *P<0.05, **P<0.01, t-test, RA vs RA+CQ. The effects of compound on the cell viability of NAMALWA cells. Survival rate of post thaw E. akaara sperm in different concentrations of glycerol and dimethyl sulfoxide (DMSO) as cryoprotective agents (CPAs). Different superscripts (normal font for glycerol, italic font for DMSO) indicate significant differences between concentrations in each CPA (P < 0.05). Asterisks indicate significant differences between glycerol and DMSO at that concentration (P < 0.05). The post-thaw spermsurvival rate was determined using a Cell Counting Kit-8 from Bimake. Cellular proliferation quantified by cell counting using Cell Counting Kit-8 assay. Cell were treated with si-RNA of SORCIN and/or ADR and cell viability was detected by CCK-8. Columns, values are expressed as mean ± SD. **p < 0.01, ***p < 0.001 versus that obtained in the control group. 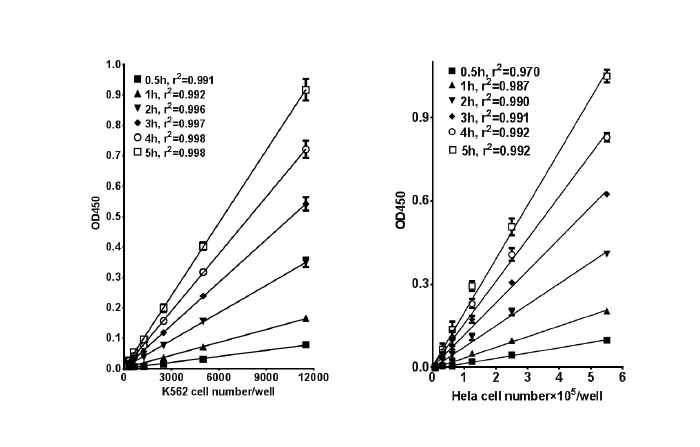 Cell viability of different groups measured using a Cell Counting Kit-8 kit (n=3). Detection of the proliferation of H522 cells transfected with siCtrl, siTMEM100-1 or siTMEM100-2 by CCK8 assay. CCK8 assays were performed to inspect the growth of pancreatic cells after alteration in LDHA expression. Fig. Different amount of cells were seeded into 96-well plate at different concentrations in 100 μl culture medium in triplicate. After adherence, 10 μl/well Bimake Cell Counting Kit-8 (CCK-8) or Dojindo CCK-8 was added, allowing cells to continuously culture for indicated duration in cell culture incubator. Absorbance at 450 nm was then measured in a microplate reader. 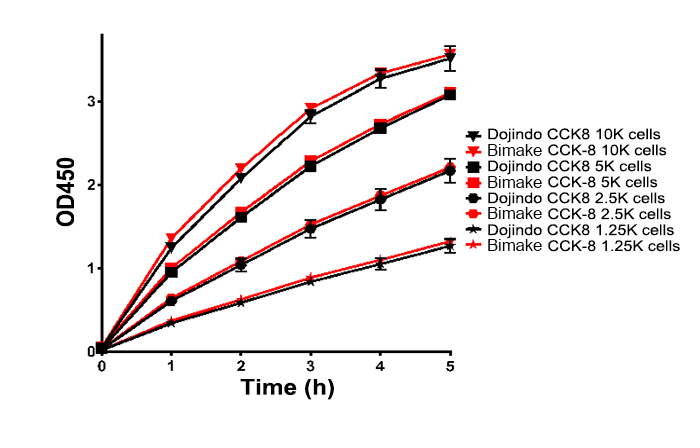 This data demonstrates comparable performance of Bimake Cell Counting Kit-8 (CCK-8) and Dojindo CCK-8. The Bimake Cell Counting Kit-8 (CCK-8) is a ready-to-use one-bottle solution which offers a simple, rapid, reliable and sensitive measurement of cell viability and cytotoxicity of various chemicals. Moreover, Cell Counting Kit-8 (CCK-8) is very safe, fast, nonradioactive and cost-effective compared to other conventional methods such as [3H]-thymidine incorporation assay. Cell Counting Kit-8 (CCK-8) is a redox indicator that utilizes the highly water-soluble tetrazolium salt WST®-8 [2-(2-methoxy-4-nitrophenyl)-3-(4-nitrophenyl)-5-(2,4-disulfophenyl)-2H-tetrazolium, monosodium salt] to produce a water-soluble formazan dye upon reduction by cellular dehydrogenases in the presence of an electron carrier 1-Methoxy PMS in the culture medium (Figure 1). The amount of the formazan dye generated by the activity of dehydrogenases in cells is directly proportional to the number of living cells (Figure 2). The detection sensitivity of Cell Counting Kit-8 (CCK-8) is higher than other tetrazolium salts such as MTT, XTT, MTS or WST-1. Figure 1: Working mechanisms of Cell Counting Kit-8 (CCK-8). 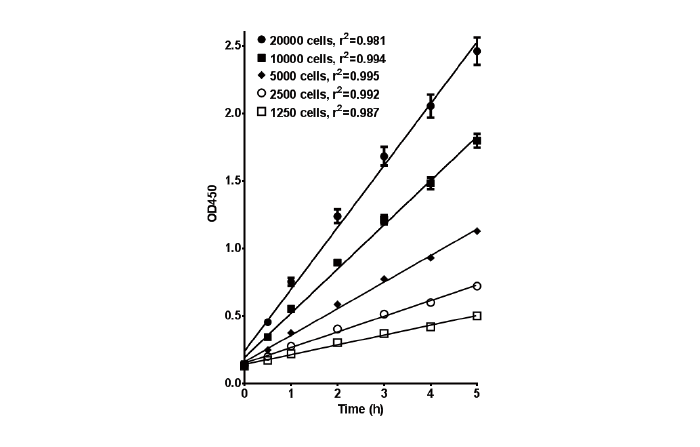 Figure 2: Cell number vs OD value using Cell Counting Kit-8 (CCK-8). K562 and Hela cells were seeded into 96-well plate at different density in 100 μl culture medium in triplicate respectively. 16 hours later, 10 μl/well Cell Counting Kit-8 (CCK-8) was added, allowing to continuously culture for indicated duration in cell culture incubator. The absorbance at 450 nm were then measured in a microplate reader. Medium only wells were served as blank control. Note the great linear relationship between cell number per well versus OD450 values at all incubation time. Figure 3: Time dependent color development using Cell Counting Kit-8 (CCK-8). HEK293 cells were seeded into 96-well plate at different concentrations in 100 μl culture medium in triplicate. 16 hours later, 10 μl/well Cell Counting Kit-8 (CCK-8) was added, allowing cells to continuously culture for indicated duration in cell culture incubator. Absorbance at 450 nm was then measured in a microplate reader. Note the highly linear relationship of color development versus incubation time at all cell concentrations. • 10 μl, 100-200 μl and multi-channel pipettes. • 1 % SDS (optional). 1) Inoculate cells in a cell culture flask or dish, and allow cells to adhere or grow for approximately 4–24 hours before proceeding with the assay. 2) Add 1/10 volume of Cell Counting Kit-8 (CCK-8) directly to cells in culture medium. Mix thoroughly to achieve a homogenous solution by lightly tapping the outside of the plate several times while avoiding bubbles. For 96-well plate, add 10 µl Cell Counting Kit-8 (CCK-8) per 100 µl culture medium. 3) Incubate in a cell culture incubator for 0.5 to 4 hours at 37°C until the color turns orange. Over incubation will give false results. Note: Sensitivity of detection increases with longer incubation times. For samples with fewer cells, use a longer incubation time of up to 24 hours. 4) Record results using microplate reader to measure the absorbance of Cell Counting Kit-8 (CCK-8) at 450 nm. Recommended OD values range between 0.8-1.5, however values between 0.5-2.5 are acceptable. Note: Slight spontaneous absorbance around 450 nm occurs in culture medium incubated with Cell Counting Kit-8 (CCK-8). This background absorbance depends on the culture medium, pH, incubation time and length of exposure to light. Typical background absorbance after 2 hours incubation is 0.1 - 0.2 absorbance units. To correct for this, prepare one or more control wells without cells, and subtract the average absorbance of the control wells from that of the other wells. 5) Optional: Add 10 μl of 1 % SDS (dissolve 0.1 g SDS with PBS buffer to prepare 10 ml solution) directly to 100 μl of cells to stop the reaction. Signals can be read within 3 days without affecting the absorbance values. A (Black): OD value of wells with culture medium and CCK-8, but without cells. 1) Cell proliferation determinations—the Bimake Cell Counting Kit-8 (CCK-8) is water soluble, stable in culture, and non-toxic. 2) Cell viability assays—metabolic activity and dye generation changes in proportion to altered viability. 3) Cytokine assays—measure cytokine-induced proliferation. Cells can be recovered and expanded at the end of the study if desired. 4) Cytotoxicity assays—Cells death from cytotoxic chemicals has no effects on color development, only living cells convert the reagent into a colorimetric indicator. The reagent itself has negligible toxicity, and is generally safe for cells. 1. Cell Counting Kit-8 (CCK-8) is ready-to-use solution. Mix the reagent to ensure a homogenous solution before use. 2. If you plan to use longer incubation time (overnight), be sure to maintain sterile conditions during reagent addition and incubation to avoid microbial contaminants. Contaminated cultures will yield erroneous results as microbial contaminants also reduce the Cell Counting Kit-8 (CCK-8). 3. Be sure to include appropriate assay controls. To minimize experimental errors, we recommend making measurements from a minimum of 3–8 replicates of experimental and medium only control. 4. This product is for R&D use only, not for medical, household, or other uses. OD values are too high (>2.5) Too many cells in well. Reduce the cell count. Pre-determination of the relationship between cell number and O.D readings is recommended. Incubation time is too long. Shorten the incubation time. OD values are too low (<0.3) Too few cells per well. Increase the cell count. Pre-determination of the relationship between cell number and O.D readings is recommended. Cell viability is too low to be tested by Cell Counting Kit-8 (CCK-8). Increase cell number per well and incubation time. If it does not work again, choose other more sensitive kits. Incubation time is too short. Increase the incubation time, up to 24 h is acceptable. Wrong wave length of reading is used. Use the optical filter or set the monochrometer between 450 nm and 490 nm to read absorbance. Color is developed by dead cells. Test compounds may reduce WST®-8 If color development occurs by mixing and incubating of Cell Counting Kit-8 (CCK-8) and test compounds, exchange the culture media and then add Cell Counting Kit-8 (CCK-8). 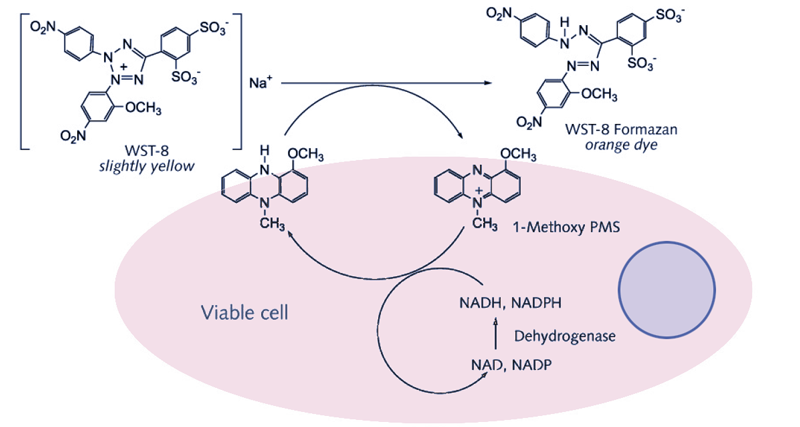 Cell lysate may reduce WST®-8. Exchange fresh culture media and then add Cell Counting Kit-8 (CCK-8). Data varies between wells Wells were not thoroughly mixed after adding Cell Counting Kit-8 (CCK-8). Exchange fresh culture media and then add Cell Counting Kit-8 (CCK-8), mix thoroughly by lightly tap the outside of the well and incubate again. Cell Counting Kit-8 (CCK-8) is not well mixed after long term storage or was exposed to freezing and thawing. Mix Cell Counting Kit-8 (CCK-8) thoroughly, exchange fresh culture media and the re-add Cell Counting Kit-8 (CCK-8). Bubbles are present in wells. Pierce bubbles with a toothpick. Cell counts are varied among wells. Re-seed cells and repeat the whole assay. The edge effect of a plate. Do not use the outer-most wells for the assay. Only add media to these wells. The absorbance of the well with a test compound is higher than that of the negative control. The compound promotes cell viability even though it is toxic substance. Cell Counting Kit-8 (CCK-8) still works bona fide in such situation. Change other assay kit with different principles. High background (blank) absorbent values The reagent may be breaking down due to multiple freeze/thaw cycles. Be sure to store Cell Counting Kit-8 (CCK-8) at 0-5 ºC in a dark place. Do not use expired products. The Cell Counting Kit-8 (CCK-8) is stable for 6 months at room temperature, 2 years at 0-5°C with protection from light. For long term storage, store at -20°C and below.